Birdwing eu hasn't added a story. Until recently poisoned baits and carcasses were only discovered after horrific incidents involving the death of significant numbers of birds and mammals, such as at Nestos in 2012 where the death toll included 30 - 40 Griffon Vultures and 4 Golden Eagles - that’s around 40% of the Greek Griffon population in one go. And then there’s Lazarus, an Egyptian Vulture nursed back to health from poisoning and fitted with a satellite transmitter. He left Greece in 2012, spent the winter in Africa and headed home in 2013. His journey took him over Egypt, Israel, war-torn Syria and Turkey, but two days after crossing the Greek border, only 200km from home, he swallowed poisoned bait. It won’t be long, at this rate, before all Greek vultures are a thing of the past. Now, however, poisoned baits can be discovered before they have time to cause major damage to wildlife. How? … well, say hello to Kiko and Kuki! These highly-trained anti-poison dogs have, in only nine months, found 30 poisoned carcasses and over 10 kg of poisoned baits. 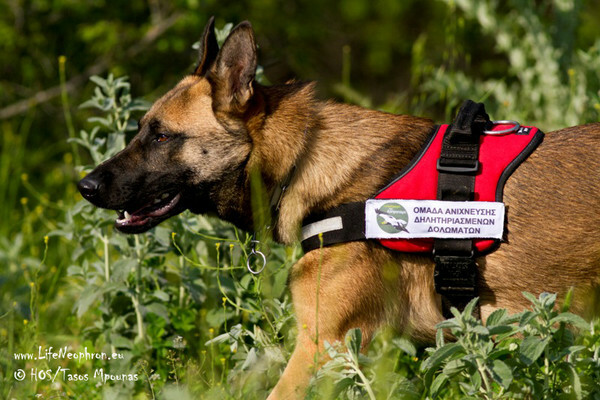 They and their handlers have carried out nearly 100 patrols covering hundreds of kilometres. 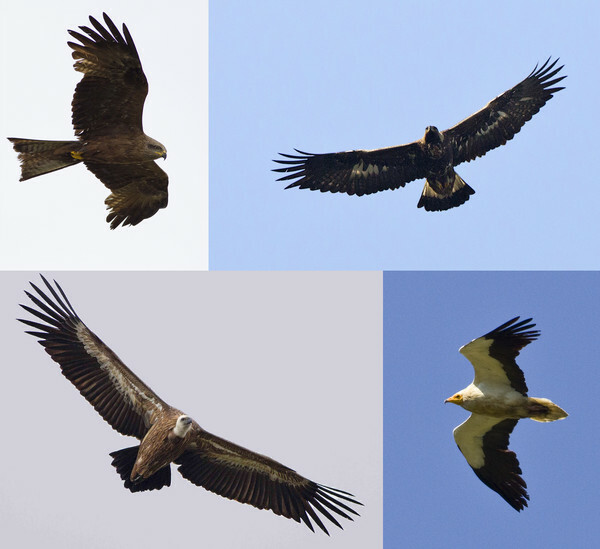 In the areas where they work – the National Parks of Dadia and Meteora - the beautiful but endangered Egyptian Vultures circle overhead. 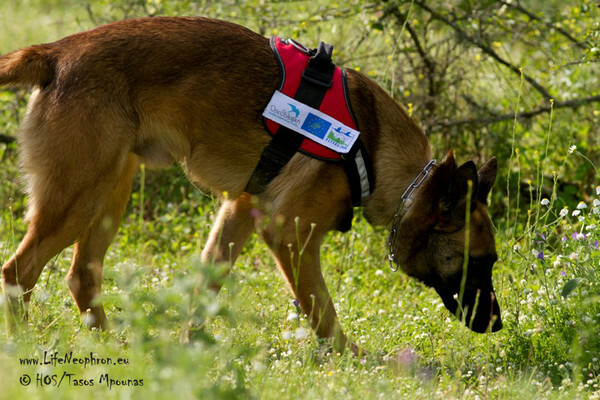 The anti-poison dogs not only find the poison, allowing it to be removed and disposed of quickly before causing devastation to wildlife, but in doing so provide information to help people identify the areas where education can be targeted to reduce and ultimately remove this type of wildlife crime. The training, upkeep and continued care for these dogs requires a large amount of money together with patrolling expenses for their handlers. So we are supporting the Greek Birdlife partner (Hellenic Ornithological Society) and the Return of the Neophron project in this work. We need donations to help keep these dogs fed and vaccinated so they are able to do these vital patrols. The dangerous and active nature of Kiko and Kuki‘s work means that food and vet’s bills each year amount to several thousand Euros. For the sake of Greek wildlife it is essential they continue to receive what’s necessary to keep them in the field. helps to protect breeding pairs of endangered Egyptian Vultures – of which only 10 breeding pairs now exist in Greece! However small, your donation will help! 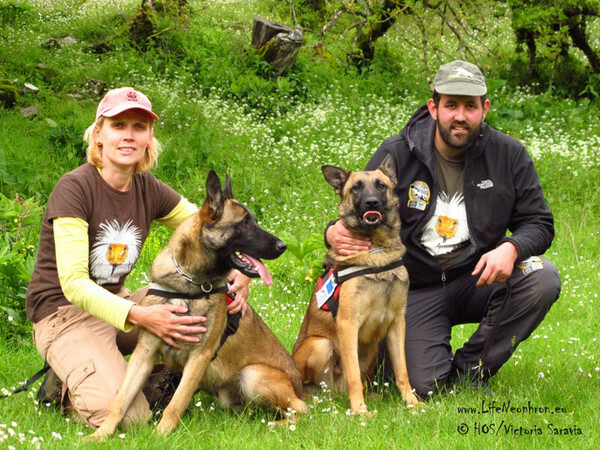 Kiko and Kuki urgently need your support. Please donate and share this appeal with others! For details of the Return of the Neophron Life Project and the Hellenic Ornithological Society who have spearheaded this project click here. To learn more about Kiko and Kuki click here. For more information on Egyptian Vultures click here. For further information on the issues of poisoned baits in Greece and education work in this area go to birdwing.eu. Please help to keep these birds safe! Birdwing eu hasn't posted any updates yet. Birdwing eu is managing the funds for this campaign.